We are very excited to announce a new segment we are starting...Meet the b + c team! This weeks spotlight member is our very own CFO Beverly Arzola! Beverly has over 12 years in the Commercial furniture industry. She started working as an Operations Manager for a local dealership in 2001 and that began her love of the industry. In 2006 Bev and her husband began their new endeavor and formed b + c Office Interiors. Taking care of the customer is one of the most important aspects of any long-term business relationship. Bev has made this her priority and has succeeded in continually going above and beyond for our clients to ensure their satisfaction. What is the most important thing that you have learned in the last five years? Learn to let things go that you cannot control. Live life to its fullest, make every day count with a smile! Welcome to Kimball's most charming piece, Joelle. Joelle's small size fits anywhere without crowding a space. It is easy to reconfigure and is perfect for impromptu meetings. Mix and match pieces to create flexible and comfortable seating. Joelle comes with a variety of contrasting fabrics options to add personality. For more information regarding the Joelle seating option, please contact info@bcfurn.com. Another successful event at b + c! We are very pleased to have had another great event in our showroom this past Wednesday evening. 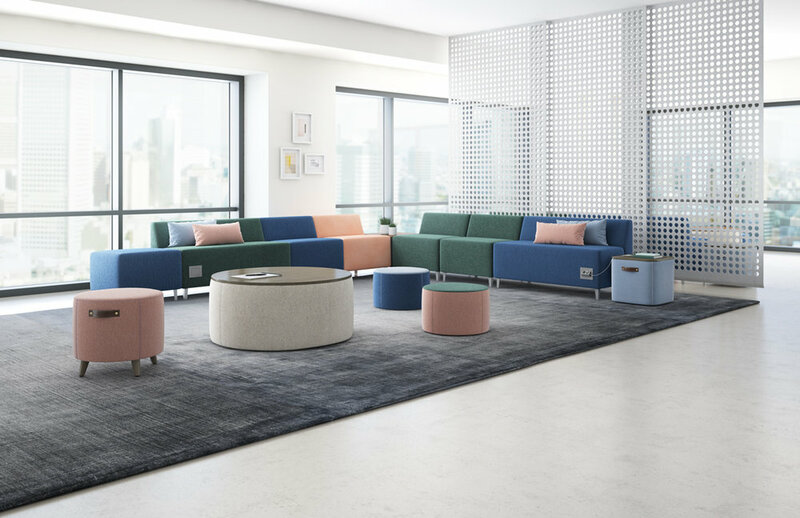 b + c Office Interiors teamed up with ergonomic furniture manufacturer Humanscale to bring designers the CEU Beyond Sustainability & Mixology Event. In honor of April being Earth month, we wanted to create an event that would be a night filled with ways to help our Earth through furniture and mixology! Sitting in fancy furniture and sipping refreshing cocktails sounds pretty fun, right? Well it was! 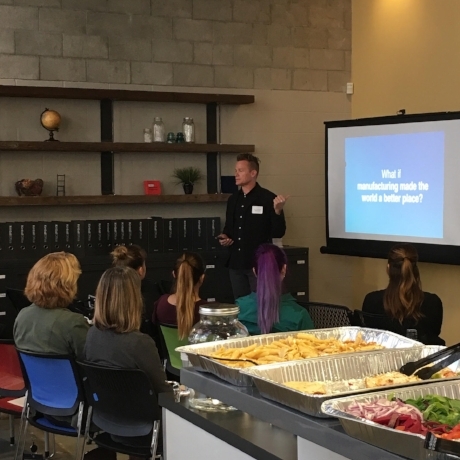 Our event featured Humanscale’s Director or Work Place Strategy, Jon Strassner. Jon gave an informative speech regarding sustainability within the furniture industry. He provided tips and tools on how we in the furniture industry can be more aware of how we are not only making but disposing our furniture. It is important for every company to practice socially responsible habits to help make our world a healthier place. After Jon’s speech our event also featured a mixology session where local mixologist Sam Peters showed guests how to re purpose ingredients to make a craft cocktail. This was super fun. Sam showed us how to make your own simple syrup from lemons, limes, oranges, etc. He provided a refreshingly well-balanced vodka or gin cocktail with freshly squeezed lemon juice, simple syrup (that he made himself), and a dehydrated lemon/lime garnish. Needless to say our guests received A LOT of information last night. 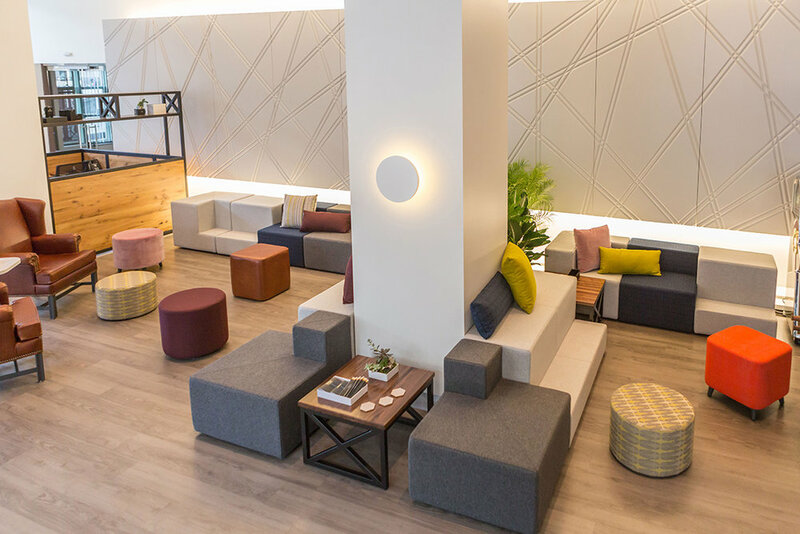 We are very thankful to have put on such a great event with Humanscale and are looking forward to many more b + c events in our San Diego Showroom. I hope you enjoyed reading about our most recent event! Stay tuned for more creative expressions by b + c Office Interiors. At b+c office interiors, we do what we can to help the environment while promoting a healthy workplace. Which is why we were excited to hear that Inscape’s Acme 50 seamless glass walls were deemed Living Building Challenge compliant. In a nutshell, this means that Acme 50 is made from materials that do not include known harmful, toxic chemicals. Yay! Acme 50 is a seamless glass wall that lets you define your office space without closing it off. With unlimited frame color options, Acme 50 blends into your company aesthetic and enhances the architectural flow so you can have the feel of an open office without having to worry about any of the noise. If you want to find out how Acme 50 can work for your office space, contact b+c office interiors to get started! We’re all familiar with the pitfalls of modern temperature control. If you’ve worked in an office for any amount of time, you’ve undoubtedly seen the fallout – coworkers huddled over their desks, barely visible beneath sweaters and blankets, clutching their third cup of coffee not because they’re tired but because their fingers are icicles. Having been there ourselves, b + c office interiors has some tips we’re pretty sure you’ll warm up to. If you’re unable to control the temperature in your office suite for any number of reasons, bring the issue up to whoever does, which is most likely the building manager. It seems pretty obvious, but you’d be surprised at how many people think they just have to power through the shivers. Send your building manager a friendly email or give them a call. It’s possible no one has mentioned it to them so they didn’t know you had to employ penguins instead of people. Appeal to their humanity and tell them poor Janet in accounting is floating away on an iceberg. Or if they’re more analytical-minded, quote the Cornell Study that states warmer temperatures lead to better productivity and fewer employee typing errors. If all else fails, remind them how much money they could save if they raise the temperature just a few degrees. Oh, and don’t forget to thank your building manager once you’ve thawed out. They’ll appreciate it. Not all the time, of course. But if your desk is directly under a vent and you’re bundled up like it’s the Ice Age, see if you can switch stations with someone who might welcome the draft. If you can’t solve the problem, you’ll have to find a way to make it work for you. While it might not look the most professional to be bundled up in a wool sweater or burritoed in a blanket, your chilly coworkers will understand. If your office doesn’t allow personal space heaters for safety reasons, fear not. There are some non-electric alternatives that won’t burn the place down if left unattended. I’ve used those mini hand and feet warmers while skiing and they’re surprisingly effective. If they can defrost my perpetually cold hands after I dropped my gloves in the snow, they’ll definitely work in the office. You might laugh at this one, but again...I’m speaking from personal experience. When I lived in England, our house was drafty and damp, and I wasn’t sure I’d last the winter without hibernating. Until a friend suggested a hot water bottle. They aren’t as popular in the US, which is a shame, but you can buy them on Amazon for about $10, and with a cute fleece or knit cover those puppies will stay hot for a while. It was honestly one of my best purchases. Even if it’s just a one-person parade (i.e. you) marching around the office. You could probably use a break from staring at the computer and the brief exercise will invigorate you. Plus, you’ll bump into coworkers, which many offices are now encouraging in order to spark discussions that could lead to innovations. Or, if you work with enthusiastic, celebratory people, you could actually start a parade. Might even turn into a fun new office tradition. We currently have two opportunities for motivated individuals who want to be part of a growing and supportive team. If you’ve always wanted to work with b+c Office Interiors, now’s your chance! Or if you know someone who’s amazing, send them our way! b+c is looking for a motivated, sustainable, and energetic salesperson to take on the Business Development position and focus on developing customers in the San Diego market. This individual will be responsible for developing and handling the account management of these clients, which includes initiating and closing profitable furniture sales. · Serves as the primary contact for the client during the sales process and works with the other furniture support functions (design, project management, furniture sales support, etc.) to ensure that client needs are met and client satisfaction is achieved. · Prospect in the local marketplace for new furniture opportunities. · Develop local business relationships with various influencers (A/D community, commercial real estate brokers, moving companies, etc.) in order to identify potential opportunities early. · Provide account management services and develop new business with existing clients. · Respond to new sales opportunities including RFPs and prospect for new business. · Lead the development of creative and innovative solutions to meet client needs with support team to provide solutions that meet client functional, aesthetic, and budgetary requirements. · Consistently meet and exceed sales targets set by b+c. · Presenting b+c products and services to clients through direct communication in face to face meetings, video or web meetings, telephone calls, and emails. · Managing and maintaining a pipeline and ensuring all sales information is current using Salesforce.com CRM software. · At least 2+ years professional sales experience. · Proven success in your sales ability and demonstrate full knowledge of the sales process. · Demonstrated customer focus and strong relationship building skills. · Demonstrated computer proficiency – Microsoft Office suite, email, internet, etc. 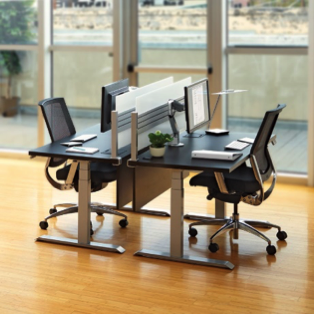 · Prior experience in the office furniture industry is a plus but not mandatory. · Excellent customer service and interpersonal skills. · Ability to prioritize and manage multiple tasks. · Demonstrated analytical, negotiating, and problem-solving skills. To apply for the Business Development/Outside Sales position with b+c, please submit a cover letter and resume to: hr@bcfurn.com. b+c is looking for a team player to support our sales staff and operations manager on projects ranging in size from small opportunities to 500 station jobs. We need a strong communicator and someone who cares about getting designs back to the sales team in a timely manner. Only candidates with corporate furniture experience will be considered. · 1+ years working with 20/20 CAP Designer software including Worksheet and Visual Impressions. · Good interpersonal skills, a positive attitude, and a can-do mentality. · Exceptional customer service skills – we believe in customers first and do whatever it takes to make them happy. To apply for the Furniture Application Specialist/Design position with b+c, please submit a cover letter and resume to hr@bcfurn.com. B+C Office Interiors provides computer desk San Diego for every room and function. Check out our website today and contact us at 858-549-3735.